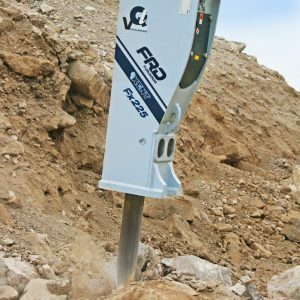 The Fx225 Qtv is designed for excavators in the 21 to 26.5 ton range, the Fx225 Qtv is a hard-hitting hammer that is a perfect choice for quarry and construction applications. Incorporating the latest in design technology, the Fx225 Qtv hammer improves day-to-day performance, offering less maintenance and downtime, smoother operation, superior strength and the highest level of reliability. 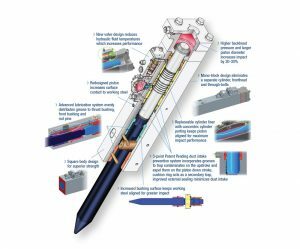 Operators appreciate performance features that include a new valve design to reduce hydraulic fluid temperatures. A redesigned piston enhances surface contact to working steel, while a larger bushing surface keeps it aligned for greater impact. A replaceable cylinder liner increases tool life and reduces time-consuming maintenance. The Fx225 Qtv offers improved durability, with features that include a square, mono-block body design for superior strength. The elimination of thru-bolts also reduces maintenance and failure. Improved internal grease routing now provides more direct lubrication to select components with inline grease fitting for easier access. The relocation of the air inlet for the patented dust intake prevention system allows it to take in air from the top of the breaker, creating a dust-free environment for cleaner, more reliable operation. All FRD USA breakers come complete with exclusive Pro-Pak for ease of installation. The Pro-Pak includes hose whips, mounting hardware, standard working steel and tool kit with operating manual at no additional charge. Impact energy class 4,250 ft. lbs. The contents of these specifications are subject to change without notice.